Only have two days to see the Grand Canyon? Don't fear! It's totally doable, and you can see loads of great stuff. With that said, let's go through my two days in the Grand Canyon! You see, my family was on a two week road trip and had a tight schedule to stick to. We plan ahead and make our hotel reservations in advance, so we had to keep moving. That doesn't hurt us, though! We just maximize our time and pack our days with fun from sun up to sun down. We stayed in Williams, AZ in this cute little ranch style inn. A heads up, the town isn't the most up-to-date, but with the time you'll spend traveling and exploring the GC, you won't care! It's a ranch-like area, with a slow pace and nice people. Prep: Fill that tank up with gas! Pack sunscreen and water and snacks! Rise and Shine was early. Travel time from Williams, AZ to Horseshoe Bend is about 2hrs and 45min - use iPhone map or Google Maps (Warning if you check the route on Bing Maps it's WAY wrong). 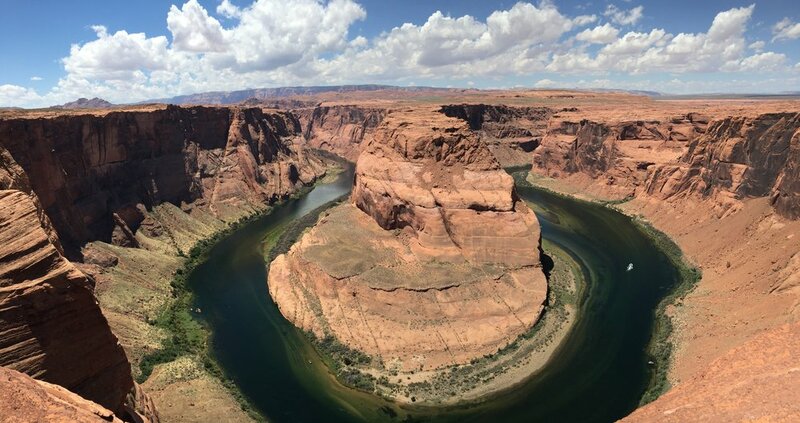 Drive up to Horseshoe Bend for the famous and amazing view of the Colorado River, in the shape of the a horseshoe nonetheless. There's plenty of parking, but you will notice cars lined along the road as you approach it. Don't panic and keep going until you get to the parking lot to check for spaces! If it's packed, then back to the road for some parking with the crowd. You will have a small hike to get to the actual viewpoint. It takes about 15min (in shape and walking with a purpose) or 30min (if you take your time). Wear sunscreen because you're literally trekking through the dessert. There are some areas to take breaks, snack and drink some water. If you're like me, though, just plow through and walk as swiftly as possible because you're so excited. After spending some time there (we were there around an hour or so), but then it was on to Page, AZ for the Antelope Canyon tour because our tour time was approaching. The drive from Horseshoe Bend to Page, AZ - where the tours pick you up for Antelope Canyons - is only 10-15min away! There are some places to grab lunch, fast food mostly, on the way. We had Sonic, but there are other options in town. Or pack your lunch in a cooler if you want to be really well prepared. Find the address on your phone of your tour location, which varies depending on what company you choose. There are a few options out there, but I chose one based on the times available and price for four peoplein our party. Each company has good and bad reviews, but if you want to see the majesty of the Upper Antelope Canyons, it really doesn't matter! They drive you to the canyons and take you through, offering photography guidance. It's a quicker tour but totally worth it and something you HAVE to do. My family wasn't sure about it before we went, but after the tour they praised me and couldn't stop talking about how amazing it was. You're welcome, fam jam. Our tour was in the afternoon, so we made our way back to Williams, which was about three hours or so. You can stop at Horseshoe Bend again if you want or if you aren't afraid of driving home in the pitch black. Sunset photos along the way could be worth it! If you chose a tour time that's early, make sure to allow 3 hours or so of driving in the morning, and then go to Horseshoe Bend afterward as you make your way down to Flagstaff or Williams. We drove to the southern entrance, "South Rim" which is very popular. There are shops and the informational center located here. It's also where you can pick up the bus transport, which takes you around to the other rims if you have anyone, who can't hike uphill, in your party or if you just want to save energy for later. There are places to grab some quick bites to eat but pack snacks, too. There isn't much to plan per se for this day. Just know you have the day to explore! Drive to the Western or Eastern Rims or hike or take the free bus transportation. Just take in the sights and enjoy. What else did we do on our trip? Check out my next blogs to see!